Originating during the 1920's, the Argentino Dogo breed was developed by Dr. Antonio Nores Martinez to be a fearless big game hunter. They were also used in police and military work as well as a family guard dog and guide dog. However, Argentino Dogo's became a favorite of those involved in the bloodsport of dog fighting and as a result gained negative notoriety. In 1991 the Argentine Dogo was banned in Britain under the Dangerous Dog Act. They are also banned in Australia. With a unique coat, extremely strong jaws, and intense expression, the Argentine Dogo is a muscular breed of Mastiff proportion. This breed is highly intelligent, courageous, and mentally stable. Unprovoked aggressiveness or cowardice is considered to be a severe defect. The Argentine Dogo is not recommended for the first time dog owner. This breed is extremely dominant and requires a dominant owner. It is crucial that new owners find ethical and reputable breeders as a steady temperament is imperative. Argentine Dogo's are loyal and devoted to family and make excellent guardians of their home and territory. They will do well with other pets they have been raised with. They are good with children but should never be left unsupervised. 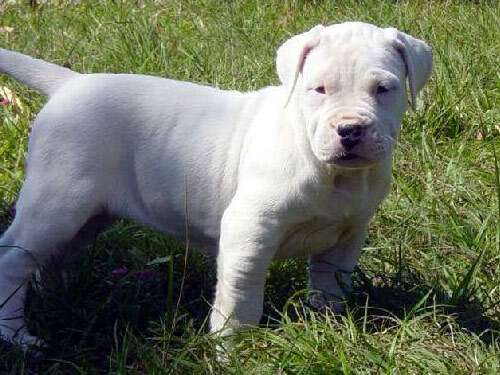 The Argentine Dogo is a breed that exhibits dignity and is imposing in appearance. Potential owners need to be aware that this breed may be targeted for banning laws. In addition, insurance companies may refuse to provide homeowner policies due to the risk of legal issues. The Argentine Dogo coat is glossy, thick, short and is soft in texture. They are constant shedders. Early intense socialization and obedience training is an absolute must. The Argentine Dogo breed is highly intelligent and training must be done with respect, love, firmness, fairness, and consistency. The Argentine Dogo responds well to reward. Unpredictable behavior can occur if training is done with harshness, kennel isolation, or a regime of tough training. They excel in agility, as guide dogs, and police work. Argentine Dogo's thrive on athletic activity and vigorous exercise. They are not recommended for apartment living. They do best in a securely fenced yard. The Argentine Dogo's make good walking and jogging companions provided they are securely leashed and muzzled when in public.